The EU-GDPR is coming, will you be ready for 2018? A current Gartner study shows that around 50 percent of all organizations will not fully meet the new EU Regulation by the end of 2018. In order to ensure that your company is successfully prepared for integrating the GDPR, you will need exact information on which data your company stores and processes. It is precisely the quality and complexity of their data that may become data protection pitfalls for companies, as they often do not know which personal data are processed where. In those cases, a good Enterprise Architect can be the key to compliance. 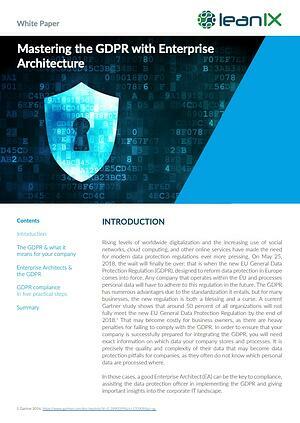 This white paper highlights all the GDPR pitfalls and shows you how EA can help you overcome them by using tools, such as the GDPR Requirements Catalog and the easy 5-Steps-Framework of LeanIX. Download your FREE white paper now and be ready on time!